I took a run around the lakes and turloughs of East Galway yesterday as I haven't done so in a while now. Good numbers of duck at Rostaff in particular Shoveler and Tufted Duck. Numbers of Coot and diving duck were significantly reduced from what they had been at Loughrea with no sign of the returning male Ring-necked Duck that was here earlier in the winter. Star the male White-tailed Eagle has now spent several weeks in the Loughrea/Slieve Aughty/Portumna area now. He made a short return visit to Connemara but has gone back yet again. Although he did visit this area last year we are becoming increasingly worried about what is happening with the female bird. She doesn't have a satellite tag and hasn't been seen in a few months now. Although she could have temporarily moved out of the area like Star, there is every likelihood that something untoward may have happened. They really should be getting down to rebuilding the nest in the next while and Stars long absents are difficult to explain. Time will tell. So back to yesterday. The highlight of the day was at Belclare Turlough where I managed to pick out a male American Wigeon out of the masses of the dabbling duck. This is about the ninth record for county Galway now. While looking at the American Wigeon I came across a striking looking drake that immediately struck me as very Baikal Teal like. However there were several things not quite right with it. 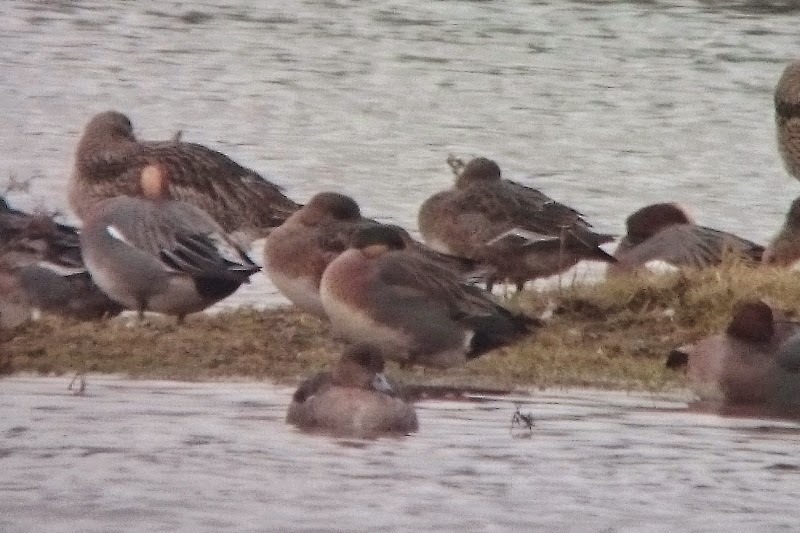 It lacked any sign of a white vertical stripe to the side of the breast, the forehead and crown were the same bright apricot colour of the face and neck sides (Wigeon influence? 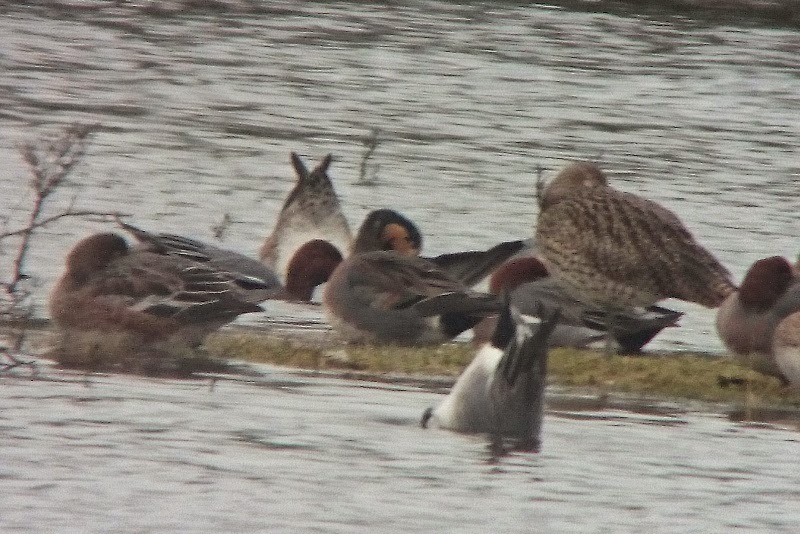 ), it lacked long scapulars and it was much closer to a Wigeon in size. Although on the other side it had a lovely bright emerald green face mask extending down along and at the back of the neck even with the tear drop line connecting the face mask with the black chin, the breast was lightly dappled pink, had grey flanks, the tail pattern was Baikal-like and the short scapulars and upperparts had limited rufous edgings. Close but no cigar I'm afraid! 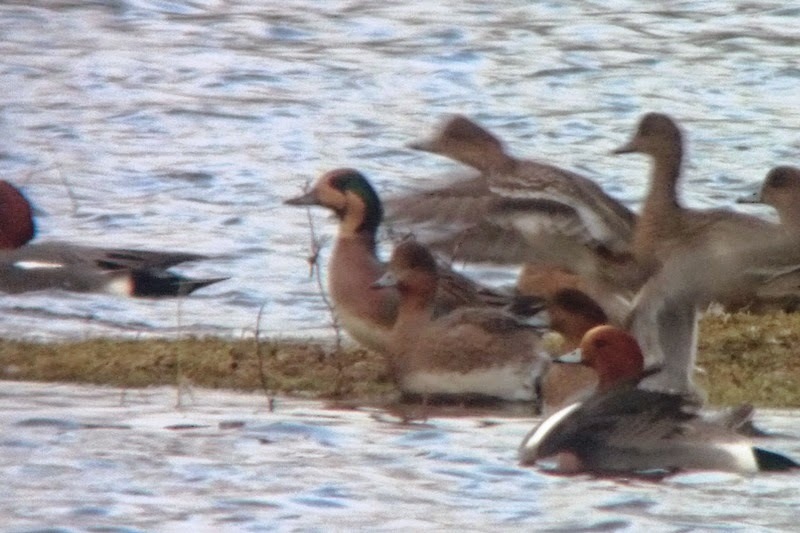 I think the most likely combination was Eurasian Wigeon x Baikal Teal. 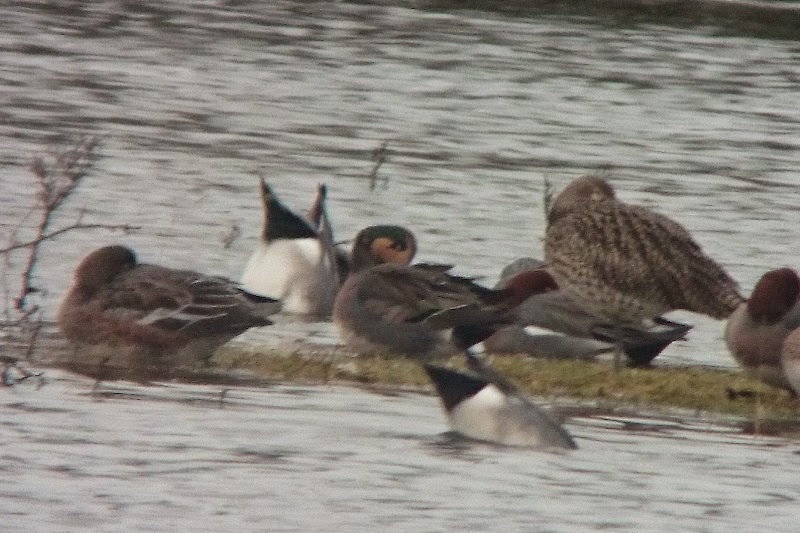 There was a Baikal-like hybrid down at Tacumshin Lake, Co. Wexford just before the first Baikal Teal was found and I've seen as few shots of other hybrids resembling Baikal Teal but the Belclare individual seems to be one of the more Baikal-like birds I've seen. If any one else has come across any better looking or similar hybrids I'd be interested in hearing about them. 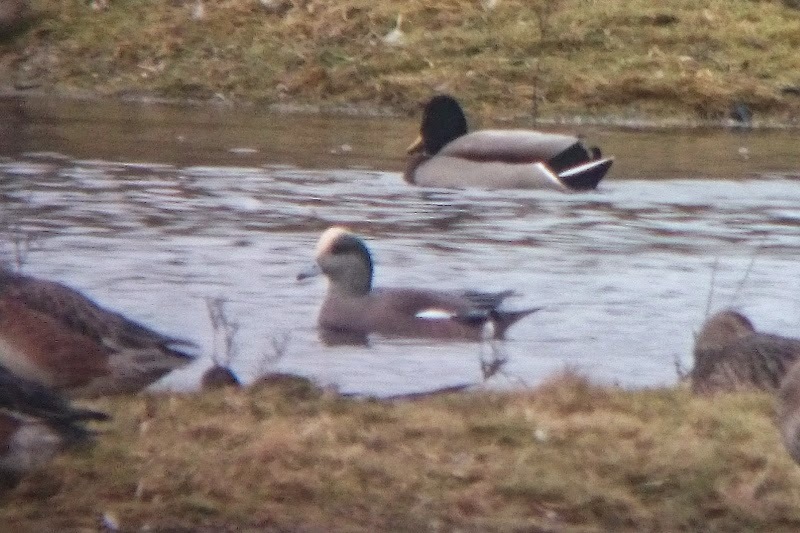 I wonder if this was a hybrid that actually originated from within the Baikal Teal breeding range? Whichever the case it certainly was a very eye-catching bird. 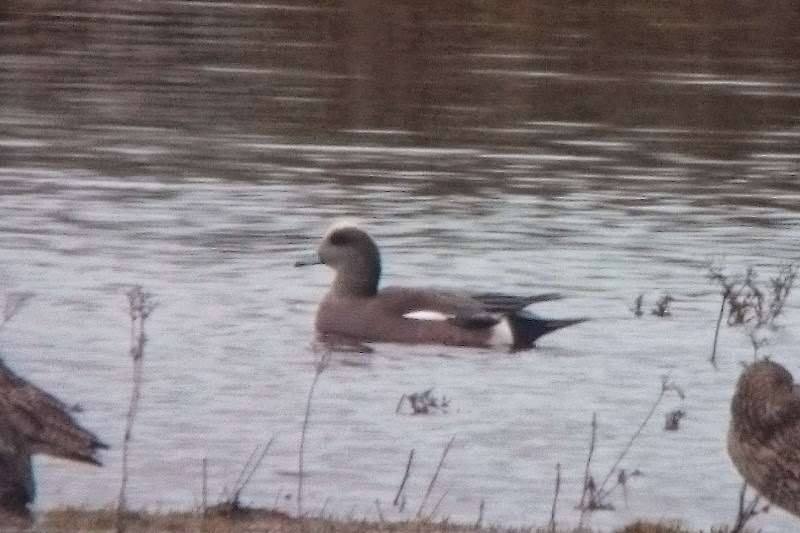 I've posted some shots and video of the hybrid and American Wigeon here but as they were taken at a distance with just the camera phone through the scope, the quality is very poor. Belclare American Wigeon from Dermot Breen on Vimeo. American Wigeon, Belclare Turlough, 24th January 2015. Baikal Teal x Eurasian Wigeon hybrid (? ), Belclare Turlough, 24th January 2015. Baikal Teal hybrid from Dermot Breen on Vimeo.